Contrast-enhanced ultrasound shows promise for liver imaging. Bubbles represent different things for different people. They bring joy to children, and they add a festive flair to revelers' celebrations. In the medical world, these small spheres of gas in liquid—microbubbles—provide clarity for radiologists when it comes to using contrast-enhanced ultrasound (CEUS). Now, with FDA approval of Lumason, a contrast agent developed by Bracco Diagnostics, those microbubble contrast agents combined with ultrasound can aid in the effective characterization of focal liver lesions in adult and pediatric patients. Lumason first received FDA approval two years ago for clinical use with cardiac issues. "This is a safe, cost-effective contrast agent that has been used around the world already," says Edward Grant, MD, chairman of radiology at the University of Southern California Keck School of Medicine. "Ultrasound contrast agents are safe and cost-effective tools that help improve the clarity of ultrasound scans." Lumason, known globally as SonoVue, is the first ultrasound contrast agent to obtain FDA approval for use in liver imaging, to improve the sensitivity and specificity of ultrasound for the differentiation between malignant and benign focal hepatic lesions. This approval also makes Lumason the first ultrasound contrast agent approved for use in the pediatric population in the United States. CEUS got its start in the United States in 2014, when it was approved for use as an aid in the cardiac arena, as a safe, high-resolution, noninvasive imaging modality that can benefit patients with coronary, carotid, or aortic atherosclerosis. Stephanie Wilson, MD, cochair of the International Contrast Ultrasound Society (ICUS) and a clinical professor of radiology and gastroenterology at the University of Calgary, says that microbubble contrast agents are easy to use, cost-effective, and particularly helpful when it comes to investigating liver masses. "While we've been using contrast-enhanced ultrasound in Canada for a number of years, we're now seeing more use of contrast-enhanced ultrasound in the United States, in cases where CT or MRI had been used in the past." According to Maria Luigia Storto, MD, head of medical affairs related to X-ray and ultrasound for Bracco Diagnostics, the successful use of CEUS for characterization of focal liver lesions is already established in several countries in Europe, where clinical use of CEUS was approved in 2001, as well as in Asia. "Around the world, we see significant improvement in terms of diagnostic performance with contrast-enhanced ultrasound when compared to regular ultrasound," Storto says. "While there are a number of indications for contrast-enhanced ultrasound in countries other than the United States, we are working on a complete clinical plan for the United States." The addition of contrast to ultrasound improves the quality of the imaging, and the increased quality doesn't mean that the patient needs to endure any increased discomfort. Grant describes the process as being "like any other imaging study," but with a small IV inserted into the patient's arm through which the contrast is administered. "First we use ultrasound to identify the lesion, and then we hook up the IV," he says. "We use a small amount of Lumason, about 1 to 1.5 cc in one port, and 10 cc of saline in another port to push the contrast into the body. Patients say they feel little to no discomfort, other than a little cold due to the saline. The contrast stays in the body for about three to five minutes, and then it goes away on its own. Very few patients experience any negative reaction." CEUS uses liquid suspensions of tiny gas microbubbles to improve the clarity of an ultrasound image without exposing patients to ionizing radiation or toxic substances, which is particularly important when a patient may also be suffering from renal failure and unable to tolerate certain contrast agents. The microbubbles work by resonating in an ultrasound beam, rapidly contracting and expanding in response to the pressure changes of the sound wave. Grant, who is also a member of the board of ICUS, explains that it's not about seeing the lesion better but about better characterizing the lesion—determining whether it is malignant or benign. "It's about the blood flow in the lesion," Grant says. "That tells us what type of lesion it is. With just ultrasound, you would see the mass but not the blood flow." Wilson has relied on CEUS for liver mass characterizations since 2002, when it was approved for use in Canada. She says prior to CEUS, using basic ultrasound to interpret liver masses was challenging, with a certain amount of guesswork involved in determining malignancy. Adding contrast created "mindboggling" results, she says. "With contrast, we have 90% to 100% accuracy, in regard to whether or not the mass is benign or malignant," Wilson says. "Contrast-enhanced ultrasound is a reliable, evidence-based tool for determining the features of a mass in the liver. We get a more precise diagnosis, and our ability to determine malignancy is vastly improved with contrast." With the introduction of CEUS, Wilson sees "incredible potential" for patient care, safety, and liver tumor management. In particular, she speaks to the growing instances of liver cancer, especially hepatocellular carcinoma and the role CEUS can play in finding and treating liver cancer. "Liver screening programs include efforts for using CT and MRI, but I believe contrast-enhanced ultrasound should be part of this protocol as well," Wilson says. "This is an area we've identified for growth in the United States." Contrast-enhanced CT or MRI introduces a high level of sensitivity, but Grant notes that some lesions can still only be seen on ultrasound. When considering a modality for lesion characterization, Grant recounts multiple scenarios where CEUS is the best option. CEUS is less expensive than CT or MRI, and it doesn't involve radiation. In addition, Lumason is not nephrotoxic, Grant adds, which makes it safe for use in patients with renal failure. "One of the most common patients who are good candidates for CEUS are those with abnormal liver function," he says. "Regular ultrasound is good, but with contrast we know if lesions are malignant or benign. Contrast gives us the answers, and the patients didn't need to undergo CT or MRI." Grant does say that CT or MRI are useful once a malignant lesion is found, in order to help with staging the cancer. However, CEUS continues to play a role as a useful modality for determining how the cancer is responding to treatment. "Contrast-enhanced ultrasound is also helpful if a mass appears indeterminate on CT or MRI, even with contrast," Grant says. "Sometimes, I will use contrast-enhanced ultrasound to see the mass better, after trying CT or MRI. With ultrasound, you're seeing characterization in real time, and that's important when you're trying to determine whether a lesion is malignant or benign." A differentiator with CEUS is the real-time view it provides. Scanning occurs in intervals with CT and MRI; imaging the effects of contrast with CT or MRI results in snapshot views rather than a continuous picture. With ultrasound, the scan is smooth and consistent. This makes a difference when it comes to seeing the contrast at the right time. "Ultrasound is a dynamic modality that shows images in real time," Wilson says. "You can watch continuously as the bubbles arrive in the liver. You can see them coming, you can see them in the liver, and then you can see them leaving. You never miss any component." While ultrasound supporters tout its clarity, there is still the issue of this technology being less automated and more operator-dependent. To minimize the challenges created by individual scanning styles, Wilson says her institution limits the number of technologists who perform CEUS. "With CT, you set protocols for the machine," she says. "With ultrasound, the technologist has to recognize what they see to get the right pictures." Positioning with abdominal CEUS can be difficult, Grant says, with difficulties reaching parts of the liver that are up and under the diaphragm. However, with the recent FDA approval and increased use of CEUS for liver, ultrasound technologists will gain more experience in handling the nuances of liver scanning. "With more experience, facilities will develop more protocols where doctors don't need to be in the room when CEUS is taking place," Grant says. Another challenge is reimbursement. There are currently no CPT codes for CEUS. Grant says that his current work-around is to bill for an abdominal or renal ultrasound. "CMS [the Centers for Medicare & Medicaid Services] did create a code for the hospital/technical component of contrast-enhanced ultrasound," he says. "We can get reimbursement for the contrast. Hopefully, organizations like the ACR can work with CMS to help us get a code for the entire process." According to Storto, CMS granted "pass-through" status for Lumason reimbursement under the Hospital Outpatient Prospective Payment System (OPPS). Contrast material is not separately paid by Medicare for outpatient hospitals under OPPS unless the product has pass-through status. Pass-through payments are amounts paid to Medicaid-managed care plans as supplemental payments or "add-ons" to the base capitation rate. The plans are required to pass through the add-on payment to designated contracted providers. Data gathered from increased clinical trials will help bring attention to the benefits of CEUS and support coverage for the procedure. For example, Wilson was involved in a large, single-trial study in Toronto where she reported success with the contrast agent Definity, which is manufactured by Lantheus Medical Imaging and is available for use in 40 countries, with approval for use in the liver in five of those countries. "With the introduction of CEUS for the liver in the US, there is the potential for increased focus on the benefits to patients," she says. Storto says that Lumason can be used with any ultrasound system, as long as the system includes a contrast package. In the United States, Toshiba America Medical Systems offers both the Aplio 300 and 500 Platinum ultrasound systems; each system includes a comprehensive contrast imaging package that allows clinicians to assess perfusion dynamics in a wide range of clinical settings. According to Paulo Ucio, senior manager for market development with Toshiba's UL business unit, that package needs to address the delicate nature of the contrast agent's most important elements. "Whether it's our basic ultrasound technology or our premium ultrasound offering, our standard ultrasound contrast package includes special harmonics," Ucio says. "While all ultrasound uses harmonics, you need to use a different wave frequency when imaging with contrast. You need something that, when it hits the bubbles, sends back information without breaking the bubbles. If you destroy the bubbles, you need to inject the patient again, which increases the cost and diminishes patient comfort. You can image longer when you use the proper harmonics." With the delicate nature of working with contrast bubbles, Ucio stresses that education is a key to advancing the use of CEUS, particularly in the United States, where the modality is relatively new to the market. "Radiologists and technologists understand the benefits of contrast, but they need help to use the contrast agent correctly and to interpret results," he says. "To that note, we're working with Bracco to help remove any challenges to adoption." With education, Wilson believes that CEUS use for liver scans in the United States could become more widespread. "The use of contrast-enhanced ultrasound for the liver in the United States is lower than we would like," she says. 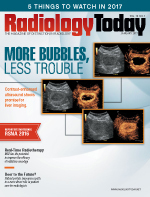 "By sharing the positive results of contrast-enhanced ultrasound, we show everyone that it's not such a formidable procedure to take on in a practice." Grant says ultrasound use in general has been rejuvenated with Lumason's approval in the United States for CEUS of the liver for lesion characterization. "There is now increased interest in conducting more contrast-enhanced ultrasound studies in the United States," Grant says. "People had given up on ultrasound, but now there is more interest in the modality."